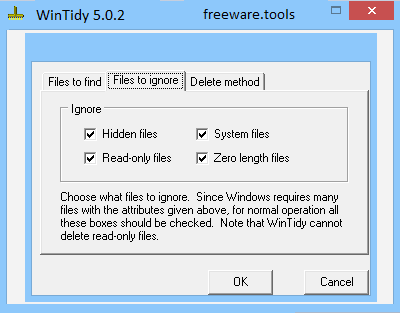 WinTidy is a tool to help recover disk space. Finds backup, object & temporary files that might be candidates for deletion and allows the user to delete one or more of these files. Can also be fully automated. WinTidy is a simple-to-use software application that can free up space on your computer by deleting unnecessary files. It can be handled even by inexperienced users. More importantly, the Windows Registry does not receive new entries, and no leftover files can be found on the hard drive after program removal. The interface of the software app is based on a standard window with an uncomplicated layout. No installation is required to use this tool. Once you select the target drive(s), WinTidy can perform an automatic scanning procedure with just the click of a button. Optionally, you can enter a folder mask if you are looking to scan only a particular directory in any of the drives. When the scanning procedure is complete, you can view details regarding the location, size, type, date of modification, attributes, version and product version for each file. This is a portable tool, so installing WinTidy is not necessary. It means that you can store the app on a USB flash drive or any other removable device, save it to any computer and directly run its executable file. Simply select the ones you want to get rid of, and let WinTidy take care of the rest. From the 'Options' area you can filter the search severity between 'normal search' and 'extra files'. The latter option allows you to find additional files associated with the Windows help system, which can be later recreated by the operating system if necessary. Furthermore, you can set WinTidy to ignore hidden, read-only, system or zero-length size, as well as specify the deletion method between 'Recycle Bin' and 'traditional delete'; the latter setting doesn't allow you to recover items and doesn't deal with read-only files. The program requires a very low amount of CPU and system memory, and quickly performs a scanning task.